We love participating in popup shows and hosting events in the Salem shop! Here's what we've been planning for you. 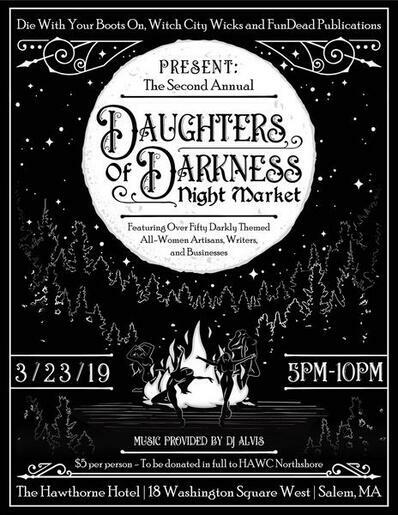 A new Salem tradition, join us for the 2nd annual Daughters of Darkness Night Market at The Hawthorne Hotel. This unique market features an all-women lineup of darkly themed artists, writers, and small businesses showcasing unique wares with a dark flair. 5 per person at the door to be donated to HAWC (cash only!). Vendors will be located on 3 levels of the hotel.